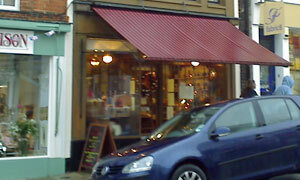 My semi-official list of Felixstowe coffee shops lists a full 35 places. A handful of these -- farewell Froffee, so long Silks, take care Tchibo -- are no longer with us. Most of them steadfastly remain. First ever one to which we took the light lunch roadshow was the grandaddy of them all, the venerable Bonnet. Our previous visit, long ago on a sunny September in 2007, was decidely underwhelming. Word on the prom, however, was that the old fella was Under New Management. Handy, then, that another old fella, our chauffeur Mr Scott, was offering a limited offer lift to the seaside. Twice round the block before we secured a parking spot on Wolsey Gardens, quickly up to the cashpoint, then out of the rain and into the warmth of the cafe. Free table upstairs by the window with a fine view of the China Garden and the anonymous cabbies' across the street. Wall art is in conjunction with the Reunion Gallery and is thankfully free of beach huts. Hey, here's someone to take our order already, and G's teapot is scaldingly hot, a sure sign of improvement. Leaf tea (!) with strainer and extra water too. James White has fallen to Fryers of Ardleigh in the battle of the locally sourced juices. Revamped menu seems more reasonably priced now with quite a few firm favourites, as Frank Sidebottom would say. Chilli for him, sausage & red onion baguette for me. Does the job nicely on a grotty day. Time enough for a top quality Americano -- hot milk on the side, naturally -- and a moist more-ish slice of Victoria sponge, peculiarly served on what looks like a pilau rice silver plate. Personal preference would be to kill the piped Richard Clayderman-esque music, otherwise it's all good. Friendly, filling, and most pleasant. Hats off to Bonnet. If it was a car -- Jaguar XJ6. If they were passing by -- P.D. James.